This colloidal silver works great on Shingles Rash! This colloidal silver works great on shingles rash. We used it on my mom when she had shingles, it helped helped the itching & helped to dry up the rash. 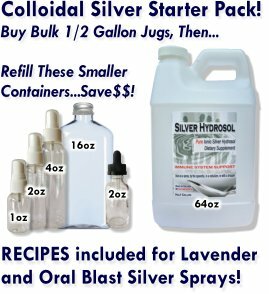 Comments for This colloidal silver works great on Shingles Rash! Thanks for sharing your testimonial about your success with shingles rash and colloidal silver! Thanks Debbie, that's great news!! We also have two colloidal silver gels that many people use for skin issues. One is our plain gel and the other is the same gel but with Lavender and a little Tea Tree oil added. Please contact me with any questions or feedback, we love to hear from our customer friends!